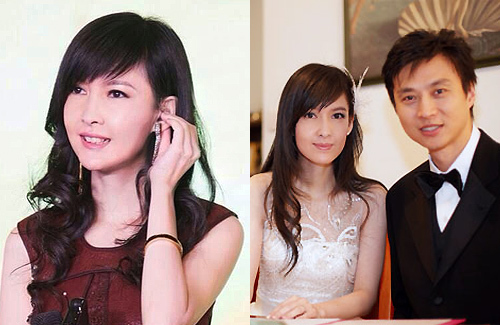 Vivian Chow and Husband Lead Separate Lives? Vivian Chow (周慧敏) and Joe Nieh (倪震) have been together for two decades, but Joe’s cheating in 2008 nearly shattered the relationship. When Joe was photographed french-kissing college student Miffty Cheung (張茆) at a nightclub, Vivian announced that she would end her relationship with Joe. Within a week, Joe patched up the relationship and the couple got married in 2009. However, the passion in their relationship may have fizzled, with Vivian and Joe currently leading separate lives. Since establishing her own production studio, Vivian has been very busy with her work schedule. In 2013, Vivian performed in her worldwide concert tour and attended a variety of functions – managing to rake in over $29.5 million HKD. During her lunch breaks, the singer would always eat alone and would only use her phone to play games. After completing her Christmas concerts in North America, Vivian spent the year-end holidays in Hong Kong. The couple was spotted going other separately by themselves without each other. Last week, Joe went out by himself to eat lunch on several occasions. On New Year’s Day, Joe stepped out for a sandwich and Vivian was not seen by his side. Perhaps feeling lonely, Vivian uploaded a 1,500 word posting on Facebook reflecting about the future. She wrote, “After being baptized, I experienced many trials again and again. Through these trials, I learned to believe in God and obey God.” She added that she “is ready to face future challenges”. Since Vivian’s career was going well, many speculated that she was complaining about rough patches in her marriage instead. 37 comments to Vivian Chow and Husband Lead Separate Lives? Vivian seems like a sweet person. She’s also so beautiful!! I can’t believe she would forgive that idiot Joe Ngai. He cheated and she took him back!! I know quite a handful of women who forgave their partner for cheating on them. Sometimes it takes more to forgive in the relationship. After all, Vivian and Joe have a 20+ years relationship. Perhaps she couldn’t put it all behind her. It is hard to let go after being with someone for so long. I wonder how you would all feel if it were the women that cheated? Life is too short to be wasted on cheating dogs. Vivian and Joe(the dog)have been together for so many years and yet he cheated. Cheating before marriage is a sign to get the hell out. Once a dog always a dog. That is not always true. Everyone makes mistakes and usually most people would cherish their second chance more than anything. Also just because you are married does not mean that you have to always be together when you have free time. You still need personal time and space. A leopard cannot change it’s spots is the phrase. And while I do believe that a few can change… for others it’s impossible. Take Bosco and Myolie.. despite Myolie giving him chance after chance, he still flirted around despite knowing about Myolie’s insecurities. I think her leaving him was a good thing… at least we won’t be reading an article like this about her in 4-5 years. There are some that can and do change,but yea there are some that do not. As the saying goes, you can change jiang shan but cannot change your ben xing. With Bosco and Myolie, you truly wonder if that was what really happened? I do not think it is right or fair to keep on thinking that it was all Bosco’s fault. After all, it does take 2 hands to clap. But of course in some cases,one is definatelty more at fault than others. Yes, it does take two hands definitely.. I think Myolie’s fault was in her insecurity over their relationship. That combined with Boscoe’s flirtyness was a recipe for a breakup. What has it got to do with dogs? Thought that DOGS are faithful animal to the owner? Nothing to do with being faithful to their owner. I think a dog just humps anything it has an urge for. So yes, I do believe once a guy feels the need to cheat, then I he’ll continue to do so. So what’s new? And why is it surprising? The writing was on the wall since the time he was discovered with that student. She unconditionally forgave him time and again (even before the student, he did have the reputation of a flirty player)… like some impossible forgiving saint. She chose her own destiny with him, and she’s really caring to his parents … sad for someone so sweet who had male admirers who in total were enough would be enough to form a small country probably. When I was a teen in SG … almost all the army dudes then had a poster of Vivian in their lockers. She was da young golden girl of their dreams. This is not counting all the other HK international male students I met later, all who also idolised her. Among the desirable eligibles in HK, I am sure Vivian could have her pick of whoever she wanted. I agreed with you! Growing up, Vivian was a dream girl to a lot of boys/men. She stayed loyal to that pathetic Joe Ngai ( who everyone hates). Joe was sooo nasty. Canti Lau sek ming used to have a crush on Vivian and Joe destroyed his career in HK by saying that Canti Lau is trying to break him and Vivian up. He even gave Canti Lau a nickname “Cancer Lau”. WTH..this Joe Ngai is an a$$$. But Vivian made her bed. If Joe really did that to Canti, what a bad person he is. I think Canti may have been a better guy for her but sadly, she chose Joe. I guess maybe it is fate? I often see good guys with bad girls and bad girls with good guys. You really wonder why? No matter what happened. Just want her to be happy. Ok, that’s just pushing it a bit too far now. Yes, Joe cheated and it’s wrong. But Vivian decided to take him back. She decided to marry him. She decided to forgive him. She decided to stay in the marriage. She decided to do all these things on her own. Joe didn’t waste her life. She did that on her own. I agree that Vivian made all of those decisions herself and no one forced her. I think Vivian deserves better too, but in the end, it is all up to her. Hope that she knows what to do to make things better for herself and Joe realizes how to treasure her before he loses her for good. that’s why vivian is a stupid weakling woman! she let joe nieh ruin her life by inviting a devil inside her house. bet that joe only want to clamor to her fame and use her for his own gain instead of truly loving her! if he had loved her he won’t cheat on her. maybe she agrees to an open marriage. Maybe she herself is no longer crazy about it but wants to maintain a facade of marital life. Maybe she is pissed off this time. Whatever it may be, she made her own choice. No one forced her to marry this cheat in the first place. Luckily for her there’s still time to make amends. Divorce him and get another better man. This time wear glasses to see the other guy better before making decisions. The guy looks alot younger than Vivian. who is this joe nieh guy? what does he do for a living? His father is Ngai Hong (Ni Kuang), the famous science fiction author who writes 卫斯理 series (Ngai Hong also helped to write Demi-Gods and Semi-Devils when Louis Cha was on holiday). Joe himself is considered a 才子. As for his career, was a radio DJ and was the leading actor in one movie, not sure what he does really but his love life was quite impressive. His ex girlfriends include beauty queens Michelle Reis and Monica Chan. He started dating Monica after breaking up with Vivian but break off with her after patching up with Vivian. vivian is so stupid. this bad guy joe evidently caught red handed cheating on her and she still forgive him? cheaters will always be cheaters and bad guys who don’t deserve to live peacefully on this earth. take patrick tang, it’s karma that his career now fell to rock bottom and katy kung instead has rising career after patrick tang cheated on her. another obvious one waiting for retribution is that stupid arrogant jerk no talent johnson lee. his face nowadays are making me disgusted and hate that he’s pairing with joey! and to this disgusting evil cheater joe, leave vivian alone you jerk. why is vivian so weak? really hate to see weak women! she’s a sweet and kind hearted person. Women tends to give in easily and she’s one of them – this is not weak. no, this IS WEAK. a great woman can be kind and sweet while strong too, but vivian gives in to the ingrateful teacher so much. You are so rude. I really wonder what you will say if one day Myolie and Bosco reconcile? I wonder if you will say the same things about Myoile? Boy, are you a mad woman. I have to agree with SelfiWu this time. Being sweet and being weak is two different thing. To me, Vivian is stupid to forgive and even married with such a man! 20 years relationship and he got caught, please, don’t try to cheat anyone, I will not believe that’s his FIRST time! It just that he never got caught by the “media” before! This is certainly not love! This guy is no scholar. A nobody that used the dad’s background to get into the entertainment industry and trying to make it but failed to do so. Making a living out of the woman that love him. What a looser!